A group of engineering students in a design course taught by associate professor Stephen Canfield are helping make the holidays happy for a 7-year-old boy with muscular dystrophy. The team of 10 designed and built a motorized bicycle that will accommodate his special needs, giving him the once impossible opportunity to ride alongside the bikes of his two older brothers. TTU's Dr. Michael Birdwell speaks at a press conference as MTSU's Tom Nolan looks on. The special gift was presented to Brendon and his mother, Michelle Priddy, earlier this week in Matthews-Daniel Hall, where Priddy works as a service coordinator for the Tennessee Early Intervention System, an organization that identifies the physical, social and emotional needs of children up to age three and coordinates services to help. Brendon was happy indeed. He squealed with delight at the first sight of his shiny, new red bike and couldn’t wait to try it out. 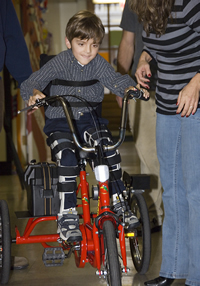 His mom raised him from his wheelchair and strapped him into the specially designed seat of the bike, and within minutes, he had the hang of the control button on its handlebars. As team members discussed final adjustments and modifications that needed to be made to the machine — like pulling the seat forward to be within easier reach of the handlebars — Brendon was already navigating hallways and corners on it like a pro. His only request, in fact, was for a working headlight. “I want the light on the front to shine,” he said, when team members finally got him to stop riding long enough to get his reaction to his new set of wheels — but even a working headlight wasn’t enough of a priority for Brendon to want to give up his new prized possession. He reluctantly returned to his wheelchair, though, and relinquished the ride to the team, who will also get class credit for the project in Canfield’s course. Canfield has a history of working with TEIS to coordinate design projects in his courses with the special needs of the disabled children the organization serves. “Because we serve children three and younger, Brendon is too old to participate in our program any longer, but because his mom, Michelle, is a TEIS service coordinator, we knew Brendon fit the bill for just this kind of project,” says Filomena Palmer, director of TEIS. The engineering students knew it too. “Most of our group members came over here today just because they wanted to see Brendon again,” Seegraves says.